Alesis's StudioDock expands your iPad's connectivity options. 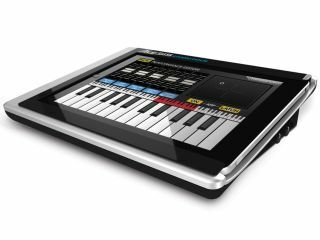 NAMM 2011: Alesis has unveiled the StudioDock, a new iPad dock that endows Apple's tablet with audio, MIDI and video I/O. The key point to make about this is that it promises to be Core Audio and MIDI compliant, meaning that it should work with most music making apps rather than just those that have been specially written to support it. The only downside is that it looks like a power supply is required to run StudioDock, which would make your iPad studio significantly less mobile. Still, we like the idea; Apple Certification is pending, as is the announcement of a price and release date.